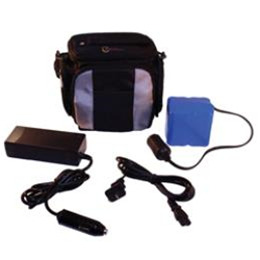 The portable Volt CPAP Battery Pack provides an alternative power supply and works with most major manufacturer’s CPAP devices. It comes in a convenient compact carry case that makes it a portable and easy-to-carry power source - great for travel, camping and even power outages! The Roscoe Volt Battery Pack comes complete with battery, AC charger and handy carrying case. The carrying case has a handle, shoulder strap and four external storage pouches to give it tremendous storage capability. The unit will provide power for up to 9 hours of operation at 15 cm H20 of pressure and up to 14 hours at 10 cm H20. Designed with a universal 12-volt socket that can accommodate standard cigarette lighter plugs from most manufacturer’s power cords. NOTE: The DC power cord is not included with the Volt™ CPAP battery pack. DC power cords must be purchased specific to your brand. Please see the chart below or ask your Roscoe Representative for further information. Affordably priced, the Volt CPAP Battery Pack is a great cash sale item.